Super Mario Maker for Nintendo 3DS is an impressive port of the Wii U game, though some of the online features have been removed since this game had a "bigger focus on building smaller communities." Which is to say, "Go outside, and share some levels via streetpass!" See if there is a way to access this in the latest version. A big Magikoopa can still randomly turn a Brick Block into one using his magic attacks. One will appear in the Make mode if the user places a Weird Mushroom in a ? 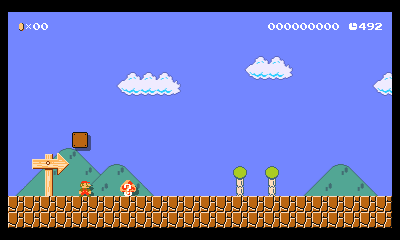 Block (in the Super Mario Bros.-style), then switches the style to any other style, runs several screens away, restores the style back to SMB, and returns. When a Mystery Mushroom is collected, Mario turns small but retains all of the abilities of Super Mario (can break brick blocks, can crouch [ ], Fire Flower combined with Super Mushroom will appear as a Fire Flower, etc.). When Mario gets hit in this form, a Super Mushroom flies off of him. Along with the Mystery Mushroom, another Amiibo functionality, the 8-bit "Big Mario" power-up was also removed. 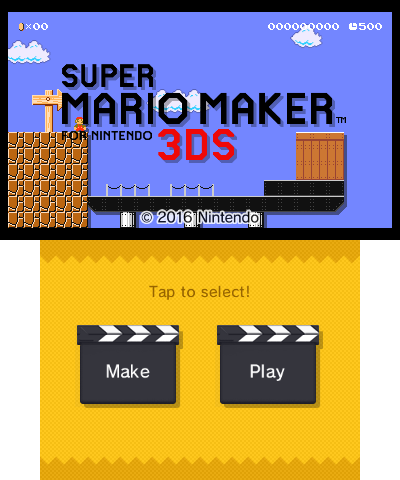 The feature still remains in the 3DS port, however, using the Classic Mario colors when enabled in-game via cheats. A single sprite exists for the modern colorization of Mario. Its original filename "M1_Player_MegaMario2Mdl" suggests it is a leftover of the Big Mushroom power-up from the Wii U game. The Nintendo 3DS version of Super Mario Maker has unused amiibo tables in /Mush/BossCharaMarioTable.byaml. None of these costumes made the cut in the final game (or even the Mystery Mushroom itself) and the table was not removed in subsequent updates. An unused duplicate of the NSMBU version of the Hard Block. This is unused because the game loads the image from the tileset and not from separate szs files. This file can be found at "Model/WU_Object_block_katai.szs". The interesting part about this is that this file also appeared in the Wii U version (albeit at that game's resolution), which means that this may have just been left in as a result of the conversion process. The other interesting part is that this image has a resolution of 32x32 while in the final, it's 16x16. The same goes for the Wii U version; the original image is 64x64, while the unused file is 128x128. An unused version of the SMB version of a Locked Door. It has no unlock-specific door, and the lock stays on the door when opened. The graphics are a minor edit of the original door, suggesting this was made very early in the locked door's development. This page was last modified on 5 March 2019, at 04:54.